Today, I only made a very simple snack bento for the kids. And the San-X character that I made today was Amagurichan. A little incident was happened in the kitchen while I was preparing this bento. I spilled the sesame seeds on the floor. And have to vacuum the floor because the sesame seeds was in everywhere, what a waste! We will have long weekend because Friday is a public holiday, so no bento for tomorrow. AMAGURICHAN is a little sweet chestnut. He doesn't have a very patient character. Mukigurichan is a little peeled chestnut. They always appear together. Inside the box : strawberries, mini oranges, crab stick rolled with egg and steamed chayote. Amagurichan was made of rice mixed with sweet soy sauce and Mukigurichan was made of rice mixed with light soy sauce. Ohh, too bad about the sesame seeds, and so hard to find every one too! I love the little chestnut faces, and you got the teardrop shape just right. Enjoy the day with your family tomorrow!! What public holiday, by the way? Im kinda out of the loop now. @Indonesia-Eats : Pep, tomorrow's public holiday is Maulid Nabi. Luckily you still have the sesame seeds left for your Amagurichan! did you dye your amagurichan character a little, rice looks a little darker. cute characters. @javapot : I was mixing with sweet soy sauce so it got darker than mixing with the light soy sauce :) Thanks a lot Javapot! I'm not familiar with the San X characters, but they sure are cute! Have a nice holiday with your kids! @hapabento : Yes, San-X characters are not as popular as Sanrio characters. But they have a lot of cute characters. Thanks a lot Debra! Nice touch of your making Aamagurichan's shape! Your cute character onigiri always has me pleased. Have a nice weekend Lia!! @tatabonita : Yes, Tata ... those butterflies are from cucumber. Thanks a lot for your lovely comment! first-thanks for your coconut water tip! That sounds AMAZING! I think I will like fresh coconut better than that Vitococo drink. When I decide to try it, I might be coming back to you for more advice. 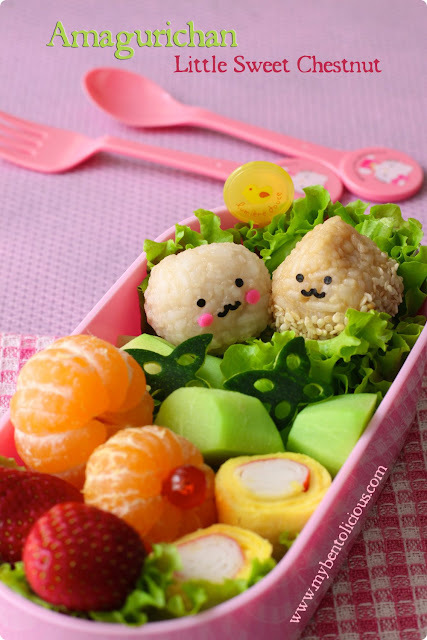 Second- your bento is very cutie today! I'm not familiar with those characters, but I hope your kids enjoy the snack! Eeeee! So cute, so pretty, I love your bento, as I always do! Wishing you a lovely long weekend, Lia!! @Anncoo : Thanks a lot Anncoo! I don't know how many characters created by San-X but I know it's a lot ... hehehe :) Have a nice weekend Anncoo! What a cute snack, the butterflies are such a nice touch!